It's been a while since I last posted a book haul here on my blog, but I always love having a nosy at what new additions are being added to the bookshelves of others and so I thought I'd bring back monthly book hauls (although sometimes it may be library loot as opposed to a haul of books purchased). If you follow me on Twitter, you'll know that as a family we went away for a mini seaside break this month and in the packing process I decided to only bring my tablet for reading material (eBooks + audio) - we were to be away for just four days total, and despite being a big physical book reader, I thought I could survive four days without an 'actual' book. Well... I was wrong. On the last day of our trip, which was essentially just the morning, not a full blown day, we made a pit stop at the Waterstones which was less than a five minute walk from our hotel - less than five minutes, it would have been rude not to stop in! In truth, I knew we had a long journey ahead of us on coaches that day and I was really itching to have a physical book in my hands once more... Because waiting the eight plus hours until we were was home just not doable, okay. 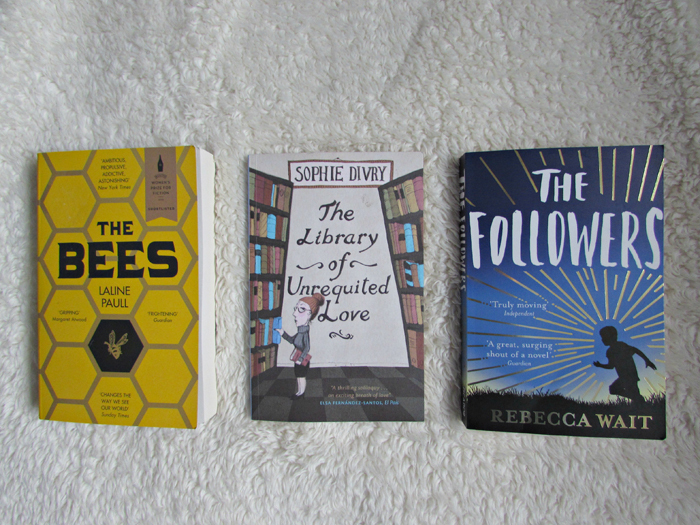 Of the three books I purchased, one was an on a whim buy (The Followers), but the other two were very much books I'd had my eye on for a while. I completed one book the coach - The Library of Unrequited Love - and also made a start on another - The Followers - which I'm still currently reading at the time of writing this post. Of all the three books I am most excited to read The Bees as I really love the concept behind it as well having heard some great feedback, however being someone who has to concentrate a fair bit when reading, the coach didn't seem to be the right time in which to begin it. If you're interested in hearing my thoughts on the other two books, they'll be included in my end of month wrap up coming next week. Have you acquired any books this month? I can do okay with just my Kindle but I know sometimes only a book will do! All 3 of these look fantastic and I've heard tons of good things about The Bees. Hope you enjoy them all! The Bees is the book I'm most looking forward to; hoping to have it read during the summer time frame. First the fun of the getaway break! then new book shopping?? and time to read even one on the return ? Perfection! Well gosh, with the bookstore so close, it would have been just mean to not pay a visit! I like my Kindle, but I tend to rotate reading books on there with holding a paper book in my hands. Switching up sounds like a good reading strategy. I read predominantly paper books and so not having one at all really got me itching for one! I think in future I'm going to try and incorporate my Kindle in to the mix a bit more. I really like the cover of The Followers. I can see me randomly grabbing it, too! Well, if you're going to splurge on some books when you're weren't really planning to do so, cracking them open immediately certainly justifies the purchase I would think :) I can't tell you how many times I have NOT done that and I really do miss diving right in. But it's my own darn fault I have so many books to read! I hadn't done that in quite some time either, Christine - it felt good! !